This is the fifth wheel hitch head and cross member only. It must be used with a fifth wheel roller assembly or uprights, sold separately. You can really feel a difference of the 16K-W fully articulating fifth wheel hitch! Once on the road, added articulation takes the torque twist out of both truck and trailer for a smoother ride and less stress on equipment. Features include heavy-duty cast uprights that allow three-position fore-and-aft adjustment for proper hitch over axle placement. Also, a patented anti-walk wrap around jaw that fully encloses the trailer kingpin and a visible safety indicator that shows red when the jaw is open. Take a look at the video posted below for more information. Mounting rails are sold separately. To make your installation even easier you may also want the Quick Install Brackets. 4-way side to side, front to rear pivoting tilt plate provides easy hookup in most situations. The locking mechamism in the tilt plate hitches do not tilt with the head; they remain stationary while only the king pin and tilt plate move. 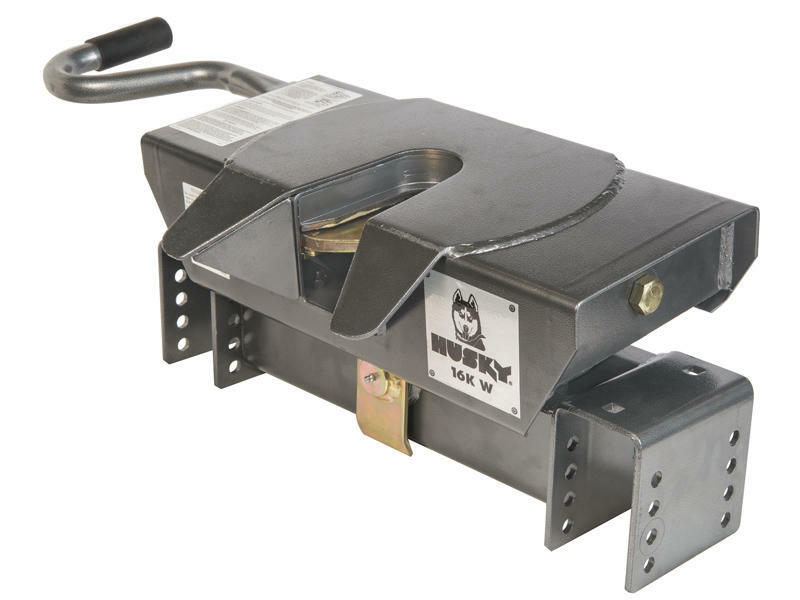 We at Husky strive to provide our customers with the most complete and innovative Towing Products available. We continue to invest in the design and development of new towing products and are committed to providing our customers with the highest level of technical and customer support. RESEARCH AND DEVELOPMENT — Our Husky R & D Center, located in Elkhart, Indiana, is capable of product design, prototyping and testing to certify that all Husky Towing Products meet and exceed all Safety Federal and State Standards. In addition, our R & D Center is dedicated to designing the next generation of innovative towing products. CUSTOMER SUPPORT AND TRAINING — In addition to Research and Development, Husky invests in the support of our customers with on-site expert towing training provided by our Husky field technicians. Our Husky field technicians travel across the country with our Husky Products Trailers equipped with hands-on displays of the Husky Product line. They provide our customers with training in Product Installation, Product Use, and most importantly, Product Safety. Husky is the only towing manufacturer with a dedicated, experienced team of towing professionals to provide on-site technical training.